Lion dance (Simplified Chinese: 舞狮; Traditional Chinese: 舞獅; pinyin: wǔshī) is a form of traditional dance in Chinese culture, in which performers in a colorful, articulate lion costume create a ritualized and stylized dance for entertainment and spiritual purposes. The history of the lion dance goes back thousands of years, and many folk tales seek to explain its origin. Because there were no lions native to China when the dance was developing, the local people developed the lion dance by imitating the movements of animals they knew, and two separate styles of the dance developed: A northern style and southern style. The northern style tended to be more explosive, incorporating stunts, while the southern style tended to be more stylized, with less realistic looking lion costumes. The lion dance continues to be an important part of Chinese culture, and as it has spread around the world with Chinese immigrants, fantastic lions can be seen performing as far away as Mexico and Chile, in Chinese New Year Celebrations, and at many other auspicious events. The lion dance is often confused with the dragon dance, but while the lion requires only two people to operate, dragons require at least three, often as many as ten or more. According to Chinese folklore, the lion brings good fortunes and protection, providing peace of mind for those who cross its path. The lion dance originated in China sometime before the Tang Dynasty (618-907). The Chinese have several stories explaining the prominence of the lion dance. One story tells of a great lion in heaven, who, like many cats, was curious and playful, always causing mischief. The Jade Emperor was perturbed by this and, due to the lion's insubordination, had the lion's head chopped off. He then threw the remains out of heaven, and down to Earth to rot. However, Kwan'Yin, the goddess of mercy, had seen the entire affair, and, feeling sorry for the mischievous lion, descended to Earth in order to help him. She tied his head back onto his body with an enchanted red ribbon. The ribbon, she said, would frighten away evil spirits and keep the lion safe from harm. Other stories tell of specific stories where the lion saved people from danger. In one version, a ferocious creature called a nian ("nian" also sounds similar to the word for "new year" in Chinese) appeared and threatened the people. A lion appeared and frightened it away. 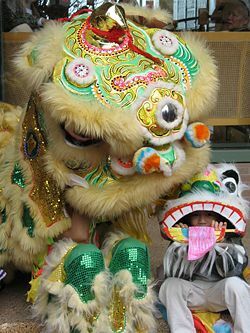 The next time the nian appeared, the lion was not nearby, so a villager dressed up like a lion and successfully frightened the nian away, and the tradition of the lion dance developed. Another variation of this story show the lion, who is the "king of beasts" defeating an enemy king who attacked with an army of elephants. 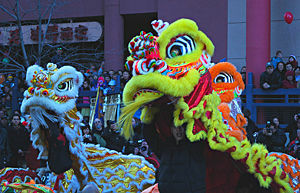 Lion dances are often mistaken for Dragon dances, such as this one, performed at a Chinese New Year celebration. 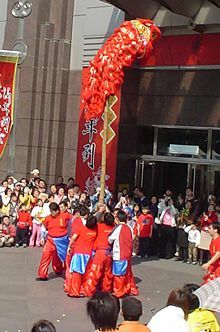 One notable difference between the two is that while the lion is performed by two dancers, while a minimum of three, and sometimes ten or more dancers are need to manipulate the dragon puppet. In yet another version, an unfamiliar creature rescued the emperor one night when he was lost after a battle, guiding him back to his troops. Describing the animal to his ministers, the emperor discovered that his rescuer was a lion. These stories portray the lion as a guardian creature. It is featured in Buddhist lore, with the Bodhisattva Manjusri riding on a lion's back. There are different variations of the lion dance in other Asian cultures including mainland China, Taiwan, Hong Kong, Macau, Japan, Okinawa, Korea, Vietnam, Malaysia, and Singapore, with each region possessing their own styles. The interesting thing is that lions themselves were not native to China. The first lions were brought to China as tribute during the reign of Emperor Shun (126-145) of the Han dynasty. Because the vast majority of people had, thus, never seen a lion, they based their lion dances on the animals they saw around them. The lion dance also appears in myths associated with the Chinese New Year. The Lion dance is often confused with the Chinese Dragon dance, which features a team of around ten or more dancers. The Lion dance usually consists of two people acting as one lion; one waves the lion head and the other controls the lion's body. Sometimes the front performer stands on the shoulders of the back performer, giving the lion great height. At other times, the lions climb or even jump to the top of tall poles and balance on small platforms at the end of the poles. Additional performers can act as a lion cub or as a silk ball, which the lion plays with. The lion dance has close relations to kung fu and the dancers are often members of local kung fu clubs. They practice in their clubs, training hard to master the acrobatic skills of the dance. Chinese lion dances can be broadly categorized into two styles, Northern (北獅) and Southern (南獅). Northern (or Beijing) style, lion dances were developed by imitating the movements of a dog, and were performed as entertainment for the imperial court. The northern lions costumes were usually in warm tones, shaggy in appearance, often with golden heads. The northern dance is often acrobatic, incorporating dangerous stunts. Southern dance (imitating a cat) is more symbolic. It is usually performed as a ceremony to exorcise evil spirits and to summon good luck and fortune. The southern lion exhibits a wide variety of colors and has a distinctive head with large eyes, a mirror on the forehead, and a single horn at center of the head. A northern style lion in red and gold with a gold head. The green bow shows it is a female. 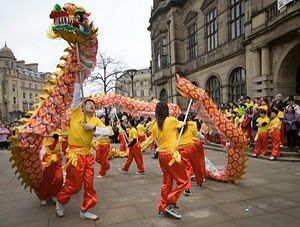 The northern style lion dance has a longer history than any other form. Some argue that during the Northern Wei Dynasty (359-534), Emperor Wudi launched an expedition to Gansu Province, capturing over 100,000 Mongols. More than 30 of the captured Mongol warriors danced for the Emperor, using large animal heads carved of wood, and wearing animal skins. The Emperor, greatly impressed, released the prisoners. He called the dance the Northern Wei Auspicious Lion Dance, and it continued to be quite popular in Northern China. There, the lions usually appear in pairs. Northern lions usually have long and shaggy orange and yellow hair with either a red bow, or a green bow on its head, depending on the gender of the lion (red for male, green for female). The ribbon, along with a mirror used to show the devil his own hideous reflection, date back to the Buddhist story of the lion cast out from heaven. During a performance, northern lions make life-like movements resembling those of a Pekingese or Fu Dog. Acrobatics are very common, with stunts like lifts, walking on wooden or bamboo stakes, jumping over tables, or balancing on a giant ball. Northern lions sometimes appear as a family, with two large "adult" lions and a pair of small "young lions." The adult lions are typically performed by two people, while the small lions require only one. The northern lion puppet is generally more realistic than the southern lion. The northern lion has a mane and four legs and makes great use of these prancing legs in its performances. A southern style lion, with a drape down the dancer's back to represent the body, rather than the more developed body of the northern lion. Guangdong is the homeland of the southern, or Cantonese style. The Cantonese style can be further divided into Fat Shan (Buddha Mountain), Hok Shan (Crane Mountain), Fat-Hok (minor style that exhibits a hybrid of Fat Shan and Hok Shan), Chau Ka (minor style performed by practitioners of Chau family style kung fu), and the Green Lion (Qingl Shil—popular with the Fukien/Hokkien and Taiwanese). The south embraced a more stylized version of a lion, often with only two legs, and a drape over the back. When the dancing lion enters a village or township, it is supposed to pay its respects first at the local temples, then to the ancestors at the ancestral hall, and finally through the streets to bring happiness to all the people. The Hok Shan style is more commonly known as a contemporary style. Contemporary Hok Shan style combines a southern lion head with Northern lion movements. Hok Shan style tries to reproduce a more life-like look, realistic movements, and acrobatic stunts. Its shorter tail is also a favorite among the troupes that do pole (jong) jumping. 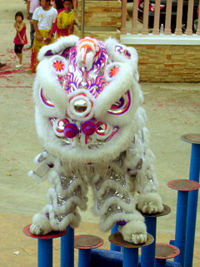 Hok Shan lion dances typically include three lions, of varying colors. The lion with the white colored fur is considered to be the oldest of the lions. The lion with the gold/yellowish fur is the considered to be the middle child. And the black colored lion is considered to be the youngest lion, so the performers executing the role of the black lino should use quick movements, like a young child. Other styles use other combinations of lion characters; sometimes liveliness (with a golden lion), courage (red lion), and friendship (green lion). Lion dancers balancing in an upright stance atop a hand held bamboo pole. Another group of three famous lion types portray three blood oath brothers, that swore to restore the Han dynasty: Liu Bei, Guan Gong (Cantonese: Kwan Kung), and Zhang Fei. These men represent historic characters in China that were recorded in the classic Romance of the Three Kingdoms. The Liu Bei (Cantonese: Lau Pei) lion is the eldest of the three brothers and has a yellow (imperial yellow, in fact, as he became the first emperor of the Shu-Han Kingdom) based face with white beard and fur (to denote his wisdom). It sports a multi colored tail which encompasses the colors of the five elements, as it was believed that being the Emperor, he had the blessings of the heavens and thus control of the five elements. There are three coins on the collar. This lion is used by schools with an established Sifu (teacher) or organization and is known Rui shih (Shui Shi) or The Auspicious Lion. The Guan Gong (Cantonese: Kwan Kung) lion has a red based face, black fur, with a long black beard (as he was also known as the "Duke with the Beautiful Beard"). The tail is red with black trim. He is known as the second brother and sports two coins on the collar. This Lion is known as Hsing Shih (Shing Shi) or the Awakened Lion. This lion is generally used by most. The Zhang Fei (Cantonese: Chang Fei) lion has a black based face with short black beard, culiflowered ears, and black fur. The tail is black with white trim. Traditionally this lion also had bells attached to the body, which served as a warning like the rattle on a rattle snake. Being the youngest of the three brothers, there is a single coin on the collar. This Lion is known as the "Fighting Lion," because Zhang Fei had a quick temper and loved to fight. This lion is used by clubs that were just starting out or by those wishing to make a challenge. Later, an additional three Lions were added to the group. The Green faced lion represented Zhao Yun or Zhao (Cantonese: Chiu) Zi Long. He has a green tail with white beard and fur and an iron horn. He is often called the fourth brother, this lion is called the Heroic Lion because it is said he rode through Cao Cao’s million man army and rescued Liu Bei’s infant and fought his way back out. The Yellow (yellow/orange) face and body with white beard represented Huang Zhong (Cantonese: Wong Tsung), he was given this color when Liu Bei rose to become Emperor. This lion is called the Righteous Lion. The white color lion is known as Ma Chao (Cantonese: Ma Chiu), he was assigned this color because he always wore a white arm band to battle against the Emperor of Wei, Cao Cao, to signify that he was in mourning for his father and brother who had been murdered by Cao Cao. Thus, this lion was known as the funeral lion. This lion is never used, except for a funeral for the Sifu or some important head of the group, and in such cases it is usually burned right after. Even if it is properly stored, it is not something one would want to keep, as it is symbolically inauspicious to have around. It is sometimes though, confused with the silver lion which sometimes has coloring similar to the white lion. These three along with Guan Yu and Zhang Fei were known as the “Five Tiger Generals of Shu,” each representing one of the colors of the five elements. 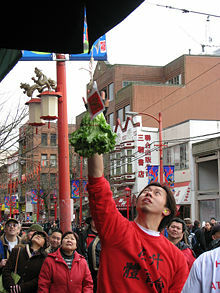 'Choi chang is a tradition at the Chinese New Year where the shopkeepers tie a clump of lettuce with a red envelope of money above the door of their shop. The lion jumps up and eats the lettuce and keeps the money. This will bring good lock to the store during the upcoming year. During the Chinese New Year, lion dancers from martial arts school will visit the store front of businesses to "choi chang" (採青 lit. picking the greens). The business would tie a red envelope filled with money to a head of lettuce and hang it high above the front door. The lion will approach the lettuce like a curious cat, consume the lettuce and spit out the lettuce leaves but not the money. The lion dance is supposed to bring good luck and fortune to the business and the dancers receive the money as reward. The tradition becomes a mutual transaction. In the old days, the lettuce was hung 15 to 20 feet above ground and only a well-trained martial artists could reach the money while dancing with a heavy lion head. These events became a public challenge. A large sum of money was rewarded, and the audience expected a good show. Sometimes, if lions from multiple martial arts schools approached the lettuce at the same time, the lions are supposed to fight to decide a winner. The lions had to fight with stylistic lion moves instead of chaotic street fighting styles. The audience would judge the quality of the martial art schools according to how the lions fought. Since the schools' reputation were at stake, the fights were usually fierce but civilized. The winner lion would then use creative methods and martial arts skills to reach the high-hanging reward. Some lions may dance on bamboo stilts and some may step on human pyramids formed by fellow students of the school. The performers and the schools would gain praise and respect on top of the large monetary reward when they did well. Nowadays, performances to attain the red envelope are not as rigorous but lion dance troupes still have the onus of making a good show or face the consequence of an unhappy client. Other types of "greens" (青) may also be used to challenge the troupe, for instance using pineapples, pomelos, bananas, oranges, sugar cane shoots and earthen pots to create pseudo barriers and challenges. The dance also performed at other important occasions including Chinese festivals, business opening ceremonies and traditional weddings. During the 1950s-60s in Hong Kong, many of the people who joined lion dance troupes could be described as gangster-like and there was a lot of fighting amongst lion dance troupes and kung fu schools. Parents were afraid to let their children join lion dance troupes because of the association with gangs. During festivals and performances, when lion dance troupes met, there would be fights between groups. 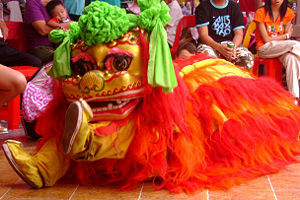 Some of the lion dance lifts and acrobatic tricks are designed for the lion to fight and knock over other rival lions. Performers even hid daggers in their shoes and clothes, which could be used to injure other lion dancers’ legs, or even attached a metal horn on their lion’s forehead, which could be used to slash other lion heads. The violence got so extreme that at one point, the Hong Kong government had to put a stop to lion dance completely. Now, as with many other countries, lion dance troupes must attain a permit from the government in order to perform lion dance. Although there is still a certain degree of competitiveness, troupes much less violent and aggressive. Today, lion dance is a more sport-oriented activity. Lion dancing is becoming popular in the United States, and in other places around the world with large Chinese immigrant populations, especially at weddings, although such performances do not come cheaply. Both lions and dragons figure prominently in Chinese New Year's Parades as well as many other celebrations throughout the year. They play an important role in such actions as consecrating buildings and temples, business openings, harvests, official celebrations, and religious rites. 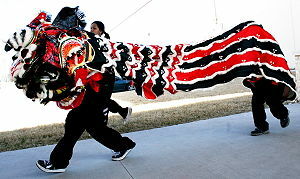 Lion Dance competitions are held in countries as distant from China as Mexico. The head of the costume is generally made of light but strong materials, like paper-mache and bamboo, over a frame of wicker or rattan. Modern heads may also use a frame of aluminum or plastic. The heads are then painted different colors, used to signify different characters. The body and tail is constructed of a cloth, attached to the head. The head's eyes, mouth, and ears are all able to be manipulated by the lead dancer. The lion dance costumes used in celebrations around the world are often made in specialty craft shops in rural China and imported at considerable expense using funds raised through subscriptions and pledges made by members of local cultural and business societies. Several movies in the Once Upon a Time in China series involve plots centered around Lion Dancing, especially Once Upon a Time in China III and IV. Jet Li has performed as a lion dancer in several of his films, including Southern style lion dancing in Once Upon a Time in China III, Once Upon a Time in China and America, and Northern style lion dancing in Shaolin Temple 2 and Shaolin Temple 3. A big budget Hong Kong action film featuring Southern style, Dancing Lion was released in Hong Kong on April 26, 2007. Plans for world-wide international release have not been announced. Producers have remarked the film was influenced by the type of Lion Dancing scenes seen in Wong Fei Hong movies by Kwan Tuk Hing, Jet Li, and Zhao Wenzhuo. A northern style lion, with orange and yellow hair, and a red bow on the head, signifying that it is a male lion. Note the mirror on the front to frighten the devil, and the small ornamental horn on the top of the head. Red Chinese lion dance performing a "choi chang" in the Vancouver suburb Richmond, British Columbia, Canada. Second Red Chinese lion dance performing a "choi chang" in the Vancouver suburb Richmond, British Columbia, Canada. A Columbia University Lion Dance Troupe performance at MTV Chi Times Square Studio using a silver Chinese lion New York, New York, United States. A black lion perched on top of poles. Black lion in an upright stance, with one dancer standing on the shoulders of his partner. A Lion dance group with four color lions, performing on a stage. Red lion with a southern style head and northern style body, performing while balancing on poles. Red lion standing upright, with the front-leg dancer standing on the shoulders of the rear-leg dancer, atop poles. ↑ 1.0 1.1 1.2 1.3 China Culture, Lion Dance. Retrieved September 21, 2008. ↑ Sifu Kenneth Wong, The Story of Chinese Lion Dancing. Retrieved September 21, 2008. ↑ 3.0 3.1 3.2 Yi Dao, History of Lion Dance. Retrieved September 21, 2008. ↑ Chris Low, Ritual and Community in Chinese New Year Traditions. Retrieved September 21, 2008. ↑ 5.0 5.1 Chinese Historical and Cultural Project, Chinese Lion. Retrieved September 21, 2008. ↑ The Kingdom of Lions, Bringing luck and happiness. Retrieved September 21, 2008. Bartlett, Dave, et al. The Lion Dance. Hong Kong: EMB, HKSAR Publishing, 2007. ISBN 9789628967124. Hu, William C. Chinese Lion Dance Explained. Ann Arbor, MI: Ars Ceramica with Chinese Performing Arts Foundation, 1995. ISBN 9780893440381. Robinson, Judith. Lion Dance Editions. Bloomington, Indiana: Open Sky Studio, 1999. OCLC 52802842. This page was last modified on 23 July 2018, at 15:39.